Labour's support for another referendum if its own Brexit plans are rejected makes the lead for most papers. 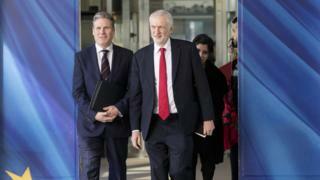 The Times says the recent Labour breakaway involving eight MPs appears to have unnerved the leadership, with senior figures understood to have demanded that Jeremy Corbyn back another vote. But the Daily Mirror reports some MPs have warned he will destroy support in Labour's Leave-backing heartlands. According to the Guardian, the move is likely to face determined opposition from dozens of MPs in Leave seats, including a significant number of frontbenchers. The Spectator website says there are a chunk of Labour MPs who refused to back an amendment delaying Brexit, so they are unlikely to come out in support of one that could potentially stop it from happening at all. On the New Statesman website, though, frontbench advocates of Labour's referendum plan say it will service both halves of the party - those in Leave seats can sell it as a vote for a deal, while those in Remain areas can cast it as a vote for a new referendum. The Financial Times thinks Labour's shift will increase pressure on Conservative Eurosceptic MPs to back Theresa May's deal, rather than extend the parliamentary stalemate and risk the prospect of Brexit being overturned. For its lead, the Daily Mail says it can reveal that Mrs May is ready to rule out the possibility of leaving the EU without a deal after "an extraordinary mass revolt by ministers". According to the paper, a group of 23 "dissidents" met secretly at the Commons to discuss how to stop such a scenario - with as many as 15 said to be ready to resign. The Sun says any move like that by the prime minister opens the door to delaying Brexit, a development that will infuriate Leavers. However, to calm their rage, she wants to keep the option of no-deal alive as a negotiating tool until later in the year, the paper adds. Several papers report that police are investigating three railway workers for common assault after a homeless man was soaked with dirty soapy water. The Daily Mail says they were caught on camera arguing with him as he lay on the pavement against the front of Sutton station in south London. According to the Daily Mirror, a witness claimed one of the workers prodded the sleeping man with a mop. The video shows the mop bucket then being emptied around him as he is told to leave. The Times reports that the man is a diabetic who had just been discharged from hospital after a chest infection. Pictures abound of people taking to parks, beaches and waterways to enjoy what the Daily Mirror calls the winter heat wave. The hottest February day on record also makes the lead for the Sun, while the Daily Express describes the mild weather as "surreal". The Daily Mail reminds readers that a year ago, we were in the grip of the Beast from the East. Look at us now, it says - and sunseekers have taken full advantage of the winter respite. "Brrr, what a scorcher", is the Guardian's headline. Elsewhere, there is shock at the findings of a study that one in 10 people over the age of 40 has type 2 diabetes - a record level driven by the obesity epidemic. The Daily Telegraph says the research by the charity Diabetes UK found major regional variations across the country, with Bradford having rates three times those of Richmond in south-west London. According to the Daily Mirror, the government must force companies to make healthier food instead of blaming consumers, who are heavily influenced by advertising. Finally, the papers take Olivia Colman to their hearts after her Oscars acceptance speech. The Daily Mirror says to blow a raspberry and stick two fingers up at the teleprompter telling her to wrap up her speech and walk away with the best actress gong must rank as one of the best performances of her life. For the Daily Express, she gave the Oscars a dollop of self-deprecating British charm. In the Telegraph's words, Olivia Colman saved the Oscars. At a ceremony with no host, she treated us to a shell-shocked speech of such purity and bumbling charm, it says, and it made her incontrovertibly the star of the show.